Arthur Miller’s 1964 play Incident at Vichy is the kind of play that well suits the Shaw Festival. Not only is play written by a contemporary of Shaw (Miller was born in 1915), but the play is set within Shaw’s lifetime (i.e. in 1942) and requires a large cast, the kind usually available nowadays only in a festival setting. More than that, however, the play is like Shaw’s since it is a play of ideas and moves forward by debate and argument. Soulpepper, however, has shown greater commitment to Miller and has already staged three of his plays – Death of a Salesman in 2010, The Price in 2011 and The Crucible in 2012. It is a pleasure then to find that Soulpepper is continuing its exploration of Miller with one of his less often staged works. Incident at Vichy proves to be an exciting and painfully timely play about the responsibility that individuals have to themselves and to each other. The action is set in an unknown building in Vichy, France, being used by Nazis and their French collaborators for interrogation. The mere fact that Miller has set the play in France rather than in Germany already suggests some of the questions the play will examine. How is it that people of a once sovereign nation can collaborate with their conqueror and adopt its most horrific methods? When the play opens seven people are seated on a single bench trying to figure out where they are and why they have been rounded up. Soon three more are added to their number. The men range in age from an ancient Jewish man to a boy of fifteen and from a gypsy to an Austrian prince. The ten thus represent all humanity. Director Alan Dilworth reinforces this notion through non-traditional casting. First Nations actor Meegwun Fairbrother plays the Gypsy, Afghan-Canadian Kawa Ada plays Monceau, black actor Peter Fernandes plays Lebeau and female Asian-Canadian actor Courtney Ch’ng Lancaster plays the Boy. Dilworth’s casting also ensures that their oppressors are also diverse. Black actor Marcel Stewart plays the First Detective and Asian-Canadian Richard Lam plays a Prison Guard. While most of the detainees would rather wait in silence, some are compelled to talk. Gradually, we discover that all of them except for Prince Von Berg (Diego Matamoros) and the Gypsy are Jewish and that many of them had fled from German-occupied France in the north to what they thought would be safer territory to the south. Most would like to believe that they have been rounded up for a routine check of their identification papers since so many in Vichy France are said to have false papers. The rumours first suggest that they are being questioned for retraining programmes to work for the Third Reich. But Bayard (Gordon Hecht), an electrician and ardent socialist, has seen a train with a Polish engineer and heard the voices of people inside the boxcars. He thinks that Vichy France, contrary to its public statements, is now enforcing Germany’s racial laws and is sending Jewish people along with other “undesirables” such as gypsies to concentration camps in Poland. From his employer who waits on the German and French officers in their office, a French Waiter (Alex Poch-Goldin) learns the terrible truth. The Jews rounded up in France are being sent directly to death camps to be exterminated. The waiting room we see becomes a waiting room for death. The remainder of the 90-minute play examines how those waiting accommodate themselves, or not, to this fact. On the most abstract level, Miller’s play in like the medieval Everyman times ten, where we witness the various ways men representative of all humanity face the inevitability of death. Some deny that they are facing death at all. Some face it heroically. Some have to be dragged struggling into it. Yet, unlike, Everyman the death these men face is not the natural death that comes to all but calculated man-made genocide. Some refuse to believe that the Germans would waste their resources during war on such senseless mass murder inside their borders. Others, like the psychologist Leduc (Stuart Hughes), see that the situation is all too possible. The point is to terrorize the population into submission. Leduc’s speeches surprisingly take on a meaning beyond the Holocaust and World War II and provide insight into the rationale for terrorism in general. Leduc argues with the Prince, who tries to hold onto ideals of hope and humanity, that as soon as men accept the baseness of their nature and their hatred of whoever is their Other, then they will realize that are all complicit in what happens whether they actively participate in atrocities or not. Leduc had been willing to organize an escape from the waiting room, but comes to realize that it is impossible. Parallel to this is a subplot among the German and French officers. A Major (Oliver Dennis) is clearly disturbed by what he has been ordered to do and tries to argue for release from this job with Professor Hoffmann (Kevin Bundy), a specialist in “anthropology” which we would now call racial profiling. The Major claims that the army has nothing to do with determining who is or is not Jewish, whereas the Professor says that it is important that the army is seen to be involved. Just as there is no physical escape for Leduc, there is no escape from the chain of command for the Major, and the penalty for escape for both is death. Anyone who has seen a well-directed play by Shaw will know that a play based on argument and debate can be thrilling – and so it is here. Alan Dilworth creates an air of tension before any of the detainees says a word and ratchets up that tension gradually right up the the play’s final moments. 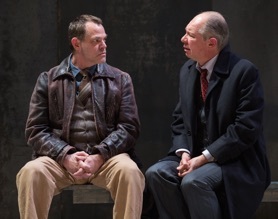 The only flaw in the production is that Dilworth assigns the initial dialogue that sets up the situation to two of Soulpepper’s less experienced members, Peter Fernandes and Gordon Hecht. Neither one is able to infuse their speech with fear and anxiety and even less with the consciousness that everything they say is public and is disturbing those who wish silence. This speech assignment is odd since more experience actors like Alex Poch-Goldin and Meegwun Fairbrother are sitting right beside them and are given almost nothing to say. The play doesn’t really take off until the conversation shifts to other characters. One of the most notable of these is the actor Monceau played by Kawa Ada. Ada reveals the actor as elegant and well-spoken but willfully naive. Monceau believes that creating an air of confidence is what will preserve him during interrogation, but even as the character states this, Ada shows Monceau’s level of anxiety increase beneath his cool façade. also also makes us realize that the Major is putting on this show to save his position if not his life. The role of Leduc the psychiatrist seems to have lit a spark in Stuart Hughes because rarely has the passion of a character taken him over so completely. In fact, the actor seems to vanish entirely into the role. He gave Leduc’s speeches intending to disillusion the Prince of his ideals the air of a person trying to convince himself of his own negative vision of mankind in order to accommodate himself better to his fate. Though Leduc claims not to be an idealist, Hughes gave his speeches the sound of an idealist outraged be what he has experienced. 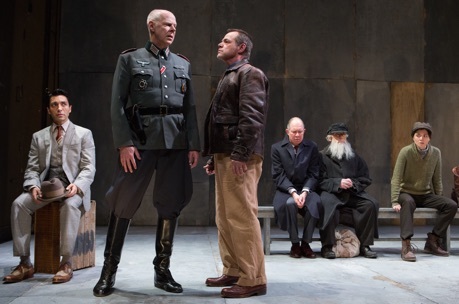 Hughes’s stands out as the most powerful, articulate and memorable performance of the play. Diego Matamoros makes the Prince a representative of the culture, elegance and idealism that people once associated with the best of the Old World. Yet, as his conversations with Leduc show him, all three of these qualities have insulated him from that savagery that mankind is capable of. Matamoros beautifully shows us how a transformation takes place in the Prince from a certain absent-minded agreeableness to a man visibly disturbed by the truths that Leduc points out to him. Matamoros is expert at demonstrating how the few measured words the Prince says represent only a handful of the ideas that Leduc’s words set coursing through his mind. As the ten detainees disappear one by one into the office, often greeted with the rude laughter of the French and German officers, the mounting atmosphere of doom surrounding the two remaining speakers, Leduc and the Prince becomes almost unbearable as the action heads to a surprising and devastating conclusion. Miller’s insight into the horrors of World War II also provides a clear framework for looking at the horrors in our world today where terrorist groups multiply and right wing xenophobia is on the rise in the U.S. and Europe. We hang on every word of Leduc and the Prince because what they discuss and what they conclude is so pertinent to our own time. 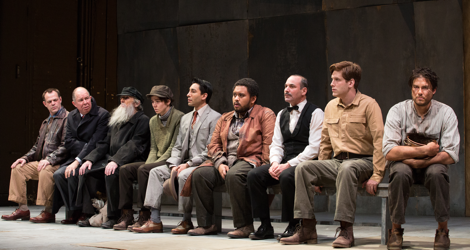 Since Incident at Vichy is a rarity, we have to be grateful that Soulpepper has staged it and has done so so well. This is an enlightening, thought-provoking play that no one should miss. Photo: (from top) Stuart Hughes, Diego Matamoros, Robert Nasmith, Courtney Ch'ng Lancaster, Kawa Ada, Peter Fernandes, Alex Poch-Goldin, Gordon Hecht and Meegwun Fairbrother; Kawa Ada, Oliver Dennis, Stuart Hughes, Diego Matamoros, Robert Nasmith & Courtney Ch'ng Lancaster; Stuart Hughes and Diego Matamoros. ©2016 Cylla von Tiedemann.